Only available from Hammacher Schlemmer, and originally crafted at mills powered by the falls of the Androscoggin River in Maine, these slippers of genuine Australian sheepskin offer exceptional comfort and warmth. The natural fleece lining is left intact during tanning and sewing to provide unsurpassed strength. Supple suede uppers and sidewalls are bolstered with extra insole padding for a more cushioned feel. The midsole is 1/2" high-density foam, topped by a 1/8" layer of memory foam that molds to the foot. Cowhide suede outsoles are durable enough to withstand years of wear without stiffness. Sheepskin collar and leather laces. Leather will expand with wear to conform to the unique shape of your foot for a comfort fit. Unisex sizes XXS (Women’s 6-7 1/2), XS (Women’s 8-9), S (Women’s 9 1/2-10 1/2; Men’s 7 1/2 -9), M (Women’s 11-12; Men’s 9 1/2-10 1/2), L (Men’s 11-11 1/2), XL (Men’s 12-13), or XXL (Men’s 13 1/2 -14 1/2). 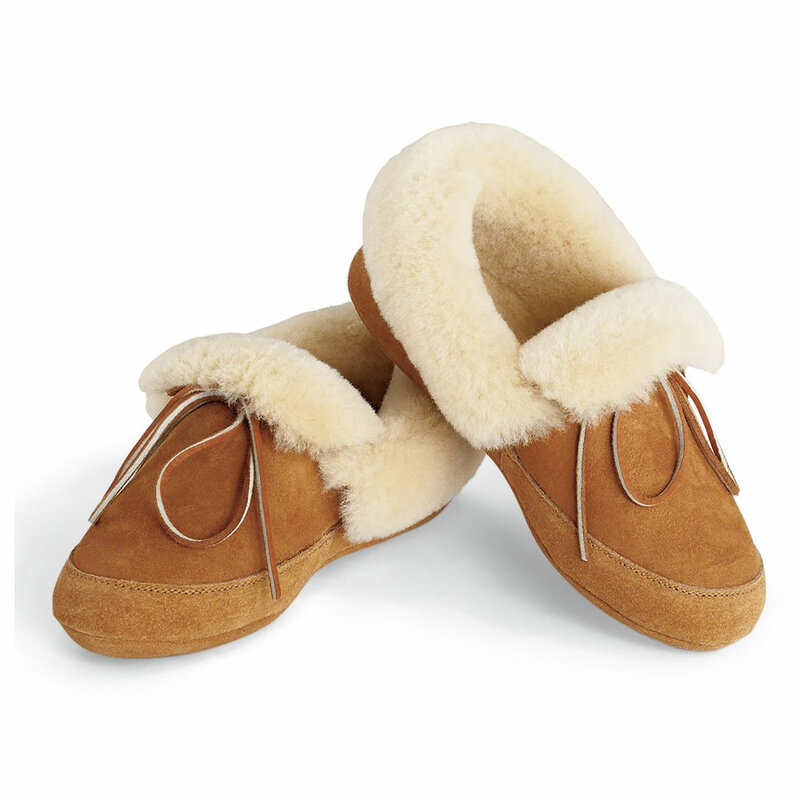 The Androscoggin Sheepskin Slippers come with The Hammacher Schlemmer Lifetime Guarantee. Items that we sell are guaranteed for their normal life under standard non-commercial use.